"I can’t get enough of Fire HD 10’s hands-free Alexa feature." "Last year, we introduced Alexa hands-free on the Fire HD 10 and customers are loving it—in fact, the Fire HD 10 is now our highest-rated Fire tablet"
"Faceprint and Voiceprint on the LG V30, they both work really well. I especially like the ‘Face Unlock’ feature." "The most exciting addition to the Fire HD 10 is the "Alexa Hands-free" mode." "Using Alexa on the Fire HD 10 (2017) is just as easy as it is on the Echo, simply utter her name and then ask or command." "The Ecobee4 is the new smart thermostat to beat (Nest who?) "
"Even with music blaring, the Sonos One will recognize the Alexa hotword without you having to shout"
"LG has provided various security options so you don’t have to use the fingerprint scanner if you don’t want. You can also unlock the phone with your face, the old school Knock Code or even your voice." "The Moto Z2 Play takes voice commands a step further...you can do things with a “show me” command...without unlocking or even touching the phone. It only works with my voice for security." VoiceGenie users will be able to chat with Google Assistant, Siri, Cortana, or Alexa anywhere -- totally hands-free. You just speak the wake word. VoiceGenie delivers low-powered speech recognition technology to wireless headphones and headsets. VoiceGenie could change the way we interact with the devices already firmly embedded in our lives -- and it could make voice assistants just as integral. Amazon is relying on voice models that are key components of Sensory’s speech recognition suite. Sensory is enabling what it calls “wakeup words” — that is, terms and phrases that trigger the always-on listening that is a hallmark of assistants like Google Now and Siri — on devices that integrate Amazon’s Alexa. Sensory, which focuses on voice recognition, teams up with Alexa's creators to make it easier for third-party developers to create voice-activated devices. 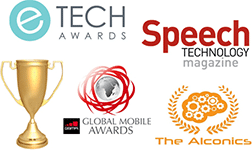 Sensory won Best Innovation in Deep Learning at the Alconics awards; First Place in Mobile Security and Privacy at the CTIA Emerging Technology (E-Tech) Awards; and Star Performer at the Speech Industry Awards, where CEO Todd Mozer also won a Luminary Award. Say out loud 'GoPro, start recording' and the camera starts recording, no fuzzing with buttons. …it works well even at a distance. You just shout "okay Garmin," the lights on the camera will blink, and then you can tell it to do things like start or stop recording, or take a photo. Huawei also created this cool feature to help you find your phone more quickly. It’s called voice wake up, and you can ask your phone “Where are you?” or some other phrase, and your phone will respond, saying, “I’m here,” and play music until you find it. The best upgrade to the controls, though, has to be voice control...The Hero5 Black understands seven languages. GoPro added voice controls for starting and stopping recordings, snapping photos and even tagging highlights in your clips by saying "That was sick!" and "Oh sh*t!" It works really well, and there are currently 10 commands and support for seven languages. So if the cloud’s not private, how can your TV respond to voice commands? Simple. Use speech-recognition services that are baked right into the TV – no cloud required. Voice commands are where both Hero 5 cameras flex their smarts. One of the coolest features on the Garmin VIRB Ultra 30 is the ability to use your voice to control the camera. Of particular interest is the fact that TrulySecure is an on-device biometric identification system that does not rely on a connection to the cloud. Many users prefer this approach because they do not wish for their biometric data to be replicated and stored outside of their personal devices. TrulySecure works by watching and listening as you repeat a passphrase a couple times. The system tracks the way your lips move and registers the unique attributes of your voice. Given Qualcomm’s prominence as a mobile technology developer and the technological advancement on display in its latest offerings, the partnership reflects very well on the confidence the company has in Sensory’s technology. With touchless control, Motorola and Google upped the ante. Speech recognition company Sensory is expanding into the computer vision space with a new smartphone security client that uses both voice and face recognition to lock down your phone. MotoX is a fantastic phone with many great features. My favorite is Touchless Control… Ask it the weather, to call a friend or do a Google search, and it'll just do it, and you never have to touch the phone. Sensory is continuing to exhibit leadership in handsfree control by allowing a secure multimodal biometric that doesn’t require touching devices to make them work. Touchless mode...is the most useful feature [on Moto X]. The defining feature of the Moto X is it’s a virtual ear, always straining to hear its owner’s voice say three magic words that will rouse it to action: "Okay, Google Now." The phone [Moto X] has all the standard features expected of today’s top smartphone, with a twist: the ability to control the phone by talking to it, without lifting a finger. The voice-response system, called BlueGenie is surprisingly accurate for such a small device. It's better than the voice system in my Blackberry phone. [BlueGenie is] an intuitive voice control system...the finest voice recognition user interface we've seen. Sensory is trying to revolutionize voice and speech recognition by creating TrulyHandsfree, which looks to evolve our interactions with our smart devices. It may not seem like much, but that little detail of getting the phone to wake up via a voice command - which Sensory calls ‘TrulyHandsfree’ - is one of the trickiest. With its dual biometric factors, AppLock comes closer to the security-and-convenience ideal than I've ever seen. LAS VEGAS and Santa Clara, Calif., – January 8, 2018 – Sensory Inc., a leader in speech and vision technologies that enhance the user experience and security of consumer electronics, today announced that its TrulyHandsfree™ speech recognition and TrulySecure™ biometric recognition/authentication technologies will be on display and demonstrable in over three-dozen sites at CES, ranging from chip manufacturers to tier-1 consumer electronics brands. TrulyHandsfree, Sensory’s top-selling technology, and the CE industry’s most widely deployed embedded always-listening wake word and voice control software solution, revolutionized voice user interfaces by offering the first commercially successful embedded small vocabulary speech recognition system to feature an always-listening wake word. Incorporating Sensory’s smartest and most efficient deep neural network technologies to date, TrulyHandsfree takes embedded voice interfaces to new heights, offering an on-device voice user interface experience that is more natural and intuitive than ever before, while a new shallow learning approach compresses the model sizes down to run in ultra-low power and with minimal memory and MIPS. Today, TrulyHandsfree can be found in leading mobile phones, apps, action cameras, IoT devices, and even toys! Much of Sensory’s success can be attributed to the company’s hard work in securing mutually beneficial relationships with leading chip manufacturers, IP providers and all leading operating systems. These relationships ensure that Sensory’s technologies are deployable across platforms like iOS, Android, and Windows, and Linux but also across all the leading low power DSPs and microcontrollers. These chip and IP partners include Ambiq Micro, Analog Devices, ARM, Avnera, Cadence, CEVA, Cirrus Logic, DSP Group, Fortemedia, Knowles, Microsemi, NXP, Qualcomm, Quicklogic, Realtek, ST Micro, Samsung LSI, Synaptics, Synopsys, Texas Instruments, VeriSilicon and XMOS. Sensory’s TrulyHandsfree, TrulySecure, and TrulyNatural™ will be enabling seamless voice control and ironclad biometric security on dozens of new products and solutions being announced at CES, from brands like 3Nod, Abalta, Amazon, Anki, AONI, Binatone, Blue Frog Robotics, Braven, Caavo, Cleer, Doss, Garmin, Hi Mirror, Holimotion, Huawei, LG, Libre Wireless, Linkplay, Logitech, Mitsubishi, Motorola, NVidia, Plantronics, Samsung, Simplehuman, Speak Music, Sugr, Voicebox, Vuzix, Google Waze and ZTE. Sensory will be providing private demos of its technologies at CES 2018. To schedule a meeting at CES, or for more information about this announcement, Sensory or its technologies, please contact sales@sensory.com; Press inquiries: press@sensory.com. TrulyHandsfree, TrulyNatural and TrulySecure are trademark of Sensory Inc.